Also serving communities of Augusta, Bellevue. There are 19 Assisted Living Facilities in the Battle Creek area, with 11 in Battle Creek and 8 nearby. The average cost of assisted living in Battle Creek is $2,710 per month. This is lower than the national median of $3,346. To help you with your search, browse the 53 reviews below for assisted living facilities in Battle Creek. On average, consumers rate assisted living in Battle Creek 4.0 out of 5 stars. Better rated regions include Charlotte with an average rating of 4.7 out of 5 stars. Caring.com has helped 5 families in Battle Creek find high-quality senior care. To speak with one of our Family Advisors about assisted living options and costs in Battle Creek, call (855) 863-8283. Named for its location near Battle Creek River, the city touts its annual cereal festival, hot air balloon festival, amateur baseball tournaments, and top ranking Binder Zoo. Seniors can experience these activities as well as nature preserves and walking trails. Michigan assisted living communities are often popularly known as homes for the aged, though official documents often use the term "adult foster care facility." Levels of care and services offered vary by the property, but residents of the 38 facilities in Battle Creek generally get room and board, transportation and 24-hour staff assistance with their activities of daily living (ADLs). Weather in Battle Creek is generally mild in summer and cold in winter, which can be tough on seniors who don't like the cold. Daily highs here average 58 degrees Fahrenheit, while lows average 37 degrees. Battle Creek gets around 35 inches of rain a year off the lake. Air quality in Calhoun County, MI, is generally good. The American Lung Association still rates Battle Creek, and the surrounding area, a little high in ozone pollution, but fine particles in the air are generally well within what's considered acceptable limits. Cost of living in the Battle Creek-Kalamazoo area is around 20 percent lower than the national average. Housing is about 40 percent cheaper here, while groceries are 20 and health care 10 percent cheaper than is common elsewhere. Battle Creek residents pay sales tax of 6 percent on most of their goods. This tax comes entirely from the state of Michigan; Battle Creek does not impose any additional taxes on commerce, though local homeowners do pay property taxes. Battle Creek has high crime rates in most categories. Residents here have a 1-in-94 chance of being the victim of a violent crime, while property crimes, such as theft, are high even by the already-high standards of Michigan, so seniors on day trips with family are advised to use cautious in town. Battle Creek Transit operates bus routes around the city that reach out somewhat into the surrounding territory. Connections are available to the public transit systems of nearby communities, such as Kalamazoo, and seniors can ride at a discount. Assisted Living costs in Battle Creek start around $2,710 per month on average, while the nationwide average cost of assisted living is $4,000 per month, according to the latest figures from Genworth’s Cost of Care Survey. It’s important to note that assisted living rates in Battle Creek and the surrounding suburbs can vary widely based on factors such as location, the level of care needed, apartment size and the types of amenities offered at each community. 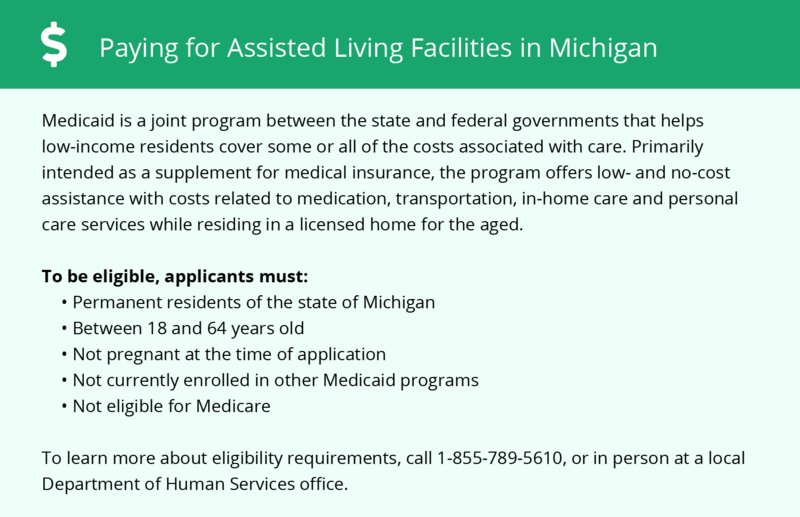 Michigan offers very little assistance with the cost of assisted living. 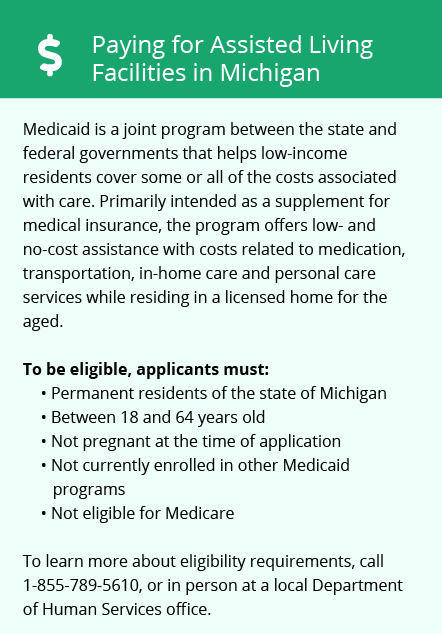 Some services received while in assisted living may be covered by the state Medicare program called Healthy Michigan. Battle Creek and the surrounding area are home to numerous government agencies and non-profit organizations offering help for seniors searching for or currently residing in an assisted living community. These organizations can also provide assistance in a number of other eldercare services such as geriatric care management, elder law advice, estate planning, finding home care and health and wellness programs. To see a list of free assisted living resources in Battle Creek, please visit our Assisted Living in Michigan page. Battle Creek-area assisted living communities must adhere to the comprehensive set of state laws and regulations that all assisted living communities in Michigan are required to follow. Visit our Assisted Living in Michigan page for more information about these laws.